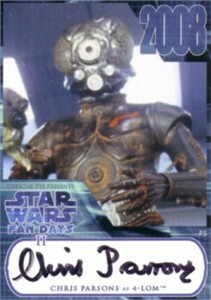 Star Wars certified autograph card of Chris Parsons, who was the man inside the costume of several droids in Star Wars Episodes V and VI, including 4-LOM as depicted on this card. This card was signed and distributed exclusively at the 2008 Star Wars Fan Days II event in Plano, Texas. ONLY ONE AVAILABLE FOR SALE.